TATS A KOOL CHALLENGE: Postman watching! I am SO reading the book! That was a wonderful vignette of a town in Ireland. Well told! Loved it. The heart - I thought I had seen it in Myra Piper's book: close, but no cigar. that is a lovely snowflake and also a lovely story. Thanks for sharing both with us. This is a lovely "post!" You really should write a book. I enjoyed your story very much. When I lived in England in the mid 80's, we had to go to base to pick up the mail. However, when we got transferred back to the U.S. and stationed in Florida, I watched the mailbox like a hawk. I was sooo lonely for my home and family in Alabama. This brings back lots of memories. Your new friend did a good job of tatting the snowflakes and the card is beautiful. LOL! I'm one who went straight for the tatting! Lovely motifs! I don't watch for the postman, he comes when 'e comes! It's usually around the same time everyday! I am usually gone when he does anyway, LOL! I enjoyed hearing about your postman. When we first moved to France we didn't have a mail-box, and the postman woould open the kitchen door and put out mail on the kitchen table. No-one ever locked a door in our area. Anyway we didn't have a bathroom, and I would wash in a bowl in the kitchen with water heated on the stove, (very Dégas) and if I timed it wrong or he timed it right, he would arrive to find me naked. He always acted completely unconcerned, just handing over the letters with a "Voila, votre courrier, au revoir"! It's a lot easier nowadays, I have both bathroom and mail box, which is lucky cos I think the sight of me naked today might leave a postman in a bad state! LOL! Well, I think Snowy's story topped yours! My mailbox is at the end of the lane and I can't see it from the house but I used to be a postman watcher. I loved getting mail, even junk mail. I'm still disappointed these days that there is so little mail. We don't write letters so much and somehow I've managed to not get the wonderful catalogs I used to. And I know personally how few tatters there are in Ireland so it is wonderful that you have found another one! When I visit again, you will have to introduce me. Snowy, you are too funny! I can't imagine a time in my whole life when I wouldn't have fainted if a man walked in on me naked! When I first moved to England, we had no hot water but we did have a bathtub. I heated the water in the kitchen and poured it into the bathtub where it promptly went stone cold before I could get more water in! What an enjoyable post! When I was a professional snowboarder I had a love affair with UPS trucks. Every week the UPS would deliver free products from my sponsors. ..and even now when I see a UPS truck my heart does a little flutter. Hi Fox, lovely comment. We are not a town tho', not even a village as we haven't got a pub! We used to call ourselves a hamlet! but I am not sure the Irish have such a word. Hi Connie, I was really worried that my story was much too long-winded...i never seem to know when to stop! Hi Tattycat, glad you enjoyed the story, nice compliment from a storyteller like you. Hi Chic, and you a storyteller too! It's good to be out and not have to wait for the postman...unless he wont leave our mail, if it has to be signed for then we can't get it until the next day. Oh! Snowy what a fab picture you conjoured up. You certainly trumped me. Wonderful evocative story. No one locked their doors here either until recently, but sadly now they do. Hi Gina, Another tatter is wonderful, even tho' we don't know each other in person, maybe one day we will. I have just had a very important visitor from tatland...more in my next post. Oh Tattycat those were the days.....way before my time of course!! I lived in the civilised North of England! Hi Ladyshuttlemaker, thanks for taking the time to read my drivel! I bet that was cool getting free products regularly. "Shamus" was part of the fabric of your community, wasn't he? - I can see him so clearly, carrying his heavy sacks of mail. I agree, you must write a book, you are the modern-day Miss Read. Once upon a time, when I was a child - and I am now a grandmother - the postman used to come TWICE a day, and once on Saturdays. Those days are long gone.....my mother was the letterbox watcher in our family, the letterbox was at the top of three flights of stairs which led to the road, and she would run up and down them countless times during the day. There was always lots of mail then, because people still wrote letters in the 50's and 60's, and my mother maintained a vast correspondence with her many friends, many of whom had also lived in India and Malaya before retiring to live in every corner of the globe. Those letters meant stamps to collect! I married a man who is a philatelist, and he was very happy to have my collection! Well having visited your little part of Ireland last Saturday and discovering that a "sat nav" doesn't take you all the way to your house, I can just imagine that postman walking up and down those roads. 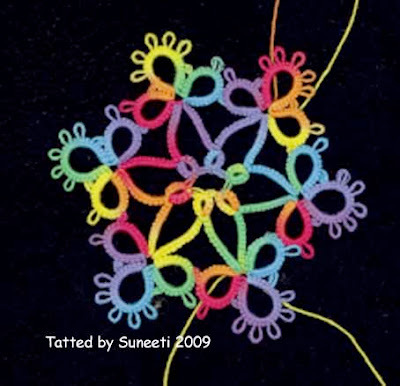 I also saw Suneeti's lovely tatting and of course yours, its much better seeing tatting "in the flesh" so to speak!! Thanks for the coffee and chocolate cake! Hi Sally, glad that you made it home safely from these wild parts! I've only just seen your post and I thoroughly enjoyed reading it. Shamus sounds like he could have delivered Father Ted's post! I am also thrilled to see my tatting displayed so beautifully on your blog for all to see. 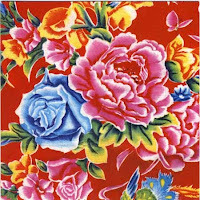 Thank you for the introduction to the very welcoming online tatting community. 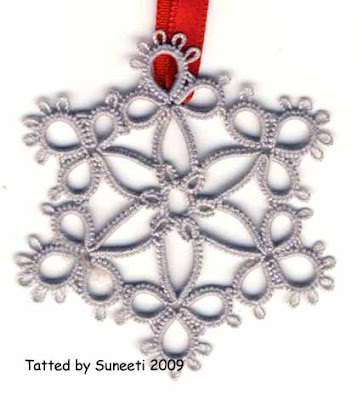 Hi Suneeti, the online tatting community is WONDERFUL. Welcome. 'Shamus' was such a character, will we ever see his like again. He's gone, along with the pretty little cottages that he used to visit. Hi Maureen, Yes he was a big part of the community, but he is gone together with the pretty little cottages that he used to deliver mail to. Oh I enjoyed your postman story!! How times have changed. Kids these days get upset if their internet connection is slow. Imagine them having to wait a week for a letter from someone who only lives a few hours away. Suneeti's motif is lovely, especially in your HDT! !